A.G. Harmon’s Some Bore Gifts is an eclectic collection of stories spanning the traditional to the satirical, with a kaleidoscope of viewpoints and characters that includes tree cutters, department store pianists, museum guides, physicians, florists, actresses, bank managers, junk salesmen, personal trainers, and English professors. Harmon is as spellbinding in his depiction of the disenfranchised as of the socially poised, with vivid scenes of both the quotidian and the aberrant and startling. This captivating book challenges and entertains from start to finish. Each of A.G. Harmon’s finely crafted stories is a portrait of a human soul—a Mexican tree cutter, burdened with a guilty heart, shares his need for atonement; a retired physician, who has been for his patients “the one to whom they held when they realized, at last, that love alone could not save them,” longs for the purpose and connection that his hobbies cannot provide; an English professor finds himself on the run, trying to escape the ecstasy his gift for teaching arouses in his students; an aging B-list actress longs for the day when she was seen and admired; an injured department store pianist comes to terms with the limits of his gifts and his life; an elderly florist rages against the changing times and attitudes that are driving her to bankruptcy; and more. All are flawed, needy human beings confronting endings of one sort or another—the loss of a dream, of a relationship or career, of an era, or of life itself—and meeting these endings with emotions that range from panic, to ecstasy, to blessed acceptance. Harmon is a gifted, compelling storyteller, and his characters are beautifully and sensitively rendered. Whether they are funny and awkward, lost and stumbling, in a panic or serene, light shines through them, gently glimmering as it plays on the threads of memory, or flaring brightly as their souls open in moments of realization. 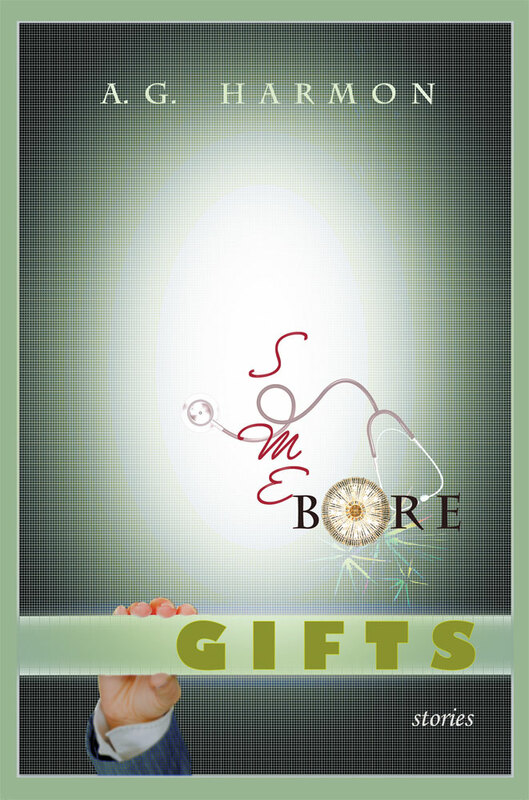 Some Bore Gifts is a fantastical take on the inner workings on the average person’s conscious mind. It is clear A.G. Harmon is precise and specific when it comes to each and every detail that he either includes or omits. The precise attention to detail and the playfulness applied to the everyday character in these stories will enchant and affect each and every person that flips through its pages. . . .
A.G. Harmon, through a broad spectrum of characters, captivates and enthralls readers with stories of everyday life. The stories in Some Bore Gifts have a life of their own, and the vivid character depictions are unlike any other. Before you know it, you’ll have finished a story about a museum guide only to realize your heart is beating like you’ve just finished a thriller. Harmon is a master of detail and doesn't waste a single word. A.G. Harmon is a writer of the first order. These are elegant and humble and ruminative stories of people reaching their worldly ends in one way or another, and their encounters there with grace and a hard-wrought hope. Some Bore Gifts is in itself a gift, and A.G. Harmon a writer who blesses us with his art. A.G. Harmon is that rare thing, a writer who loves his characters without idolizing them. In prose that is alternately crystalline and gritty, he shows how a heart in hiding can be brought back to life through a chance encounter with another. Some Bore Gifts are stories that track the movement from despair to hope, loss to restitution, the seemingly random steps we take along the road of grace. Harmon’s consummate storytelling makes us believe in, not only the resilience, but also the essential grandeur of the human spirit. In these stories, Harmon takes you—lyrically, sometimes brusquely, always with good humor—through a gallery of lives. Some full and wise, others shallow and self-concerned, still others stunted or misunderstood—a stunning human spectrum. I laughed out loud, flipped pages in worry, even felt a knife slice through my palm. But most visceral—and this is Harmon’s gift—I felt myself disappear in moments of true, transcendent beauty. 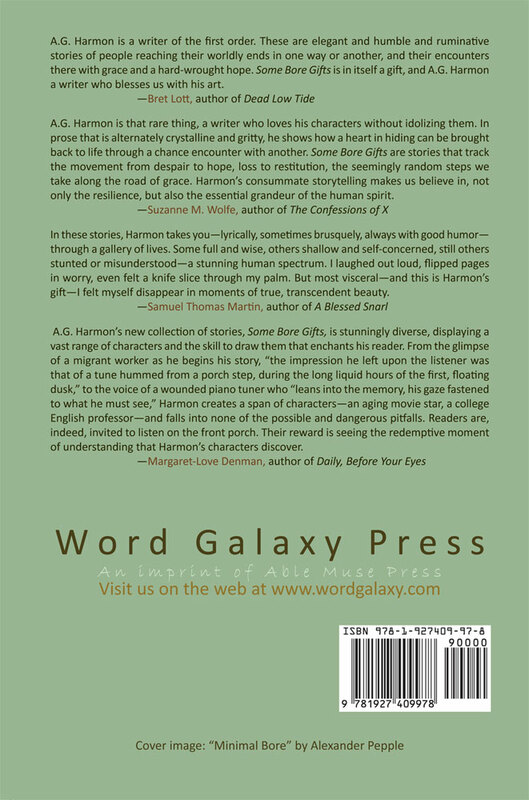 A.G. Harmon’s new collection of stories, Some Bore Gifts, is stunningly diverse, displaying a vast range of characters and the skill to draw them that enchants his reader. From the glimpse of a migrant worker as he begins his story, “the impression he left upon the listener was that of a tune hummed from a porch step, during the long liquid hours of the first, floating dusk,” to the voice of a wounded piano tuner who “leans into the memory, his gaze fastened to what he must see,” Harmon creates a span of characters—an aging movie star, a college English professor—and falls into none of the possible and dangerous pitfalls. Readers are, indeed, invited to listen on the front porch. Their reward is seeing the redemptive moment of understanding that Harmon’s characters discover. A.G. Harmon’s fiction, essays, and reviews have appeared in Triquarterly, the Antioch Review, Shenandoah, the Bellingham Review, St. Katherine Review, Image, and Commonweal, among others. His fiction won the 2001 Peter Taylor Prize (A House All Stilled, University of Tennessee Press, 2002) and was the runner-up for the 2007 William Faulkner Prize for the Novel. His academic work, Eternal Bonds, True Contracts: Law and Nature in Shakespeare’s Problem Plays was published by SUNY Press. He was a 2003 Walter Dakin fellow at the Sewanee Writers’ Conference. He grew up on horse-and-cattle farms in Mississippi and Tennessee. Currently, he teaches at The Catholic University of America in Washington, DC.